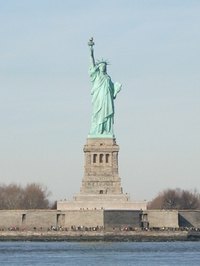 The Statue of Liberty is a popular American symbol that represents freedom for all. A Statue of Liberty costume can be a great way to pay homage to America, while having some fun dressing up for a holiday like Halloween or the Fourth of July. With a few straightforward steps, you can create your own Statue of Liberty costume. Purchase light green bed sheets, twin size for a child’s costume or full size for an adult. You can also buy white sheets and dye them using light green fabric dye, following the manufacturer's instructions. Cut out six long triangles from light green craft foam that matches your bed sheet color or spray-paint white foam with a green color. Make triangles with four-inch-wide bases and 10-inch-long sides. Spray-paint your flip-flops with light green paint that matches your sheets; also spray-paint your plastic headband, cardboard roll and the book. Give the paint an hour to dry. Apply a small strip of super glue to the base of one of your triangles. Place it on the headband near one end and continue to glue the triangles about 1/2 inch apart across to the other end of the headband. Take two sheets of orange tissue paper and bunch them up with two sheets of red tissue paper. Glue them to the top of your cardboard roll. This will serve as your torch for the costume. Wrap your sheet around your body like a toga. Drape one end of the sheet over your right shoulder and wrap the fabric under your left arm and around your body once or twice and then tie it in a knot with the fabric you draped over your shoulder. Or you can cut a hole in the center of the sheet for your head to go through and use a rope spray-painted green as a belt to give your costume more shape. Put on your headband and flip-flops and pick up your torch and tablet. For a more complete look, you can also apply light green body paint to your face and any areas where your skin is exposed and use green spray-on hair paint. You can also spray-paint a flashlight green and use that as a torch. This is a great idea for kids who are trick-or-treating at nighttime, as it makes them more visible and they can use it for guidance when walking around.